Most of the arsenic used as an antibiotic in commercial broiler production ends up in the litter. Using this litter as a soil amendment is not prohibited by the National Organic Program, but 7CFR S205.203(c) of the Rule requires that "the producer must manage plant and animal materials to maintain or improve soil organic matter content in a manner that does not contribute to contamination of crops, soil, or water by plant nutrients, pathogenic organisms, heavy metals, or residues of prohibited substances." Poultry litter applied at agronomic levels, using good soil conservation practices, generally will not raise arsenic concentrations sufficiently over background levels to pose environmental or human heath risks. However, recent studies show that more than 70% of the arsenic in uncovered piles of poultry litter can be dissolved by rainfall and potentially leach into lakes or streams. 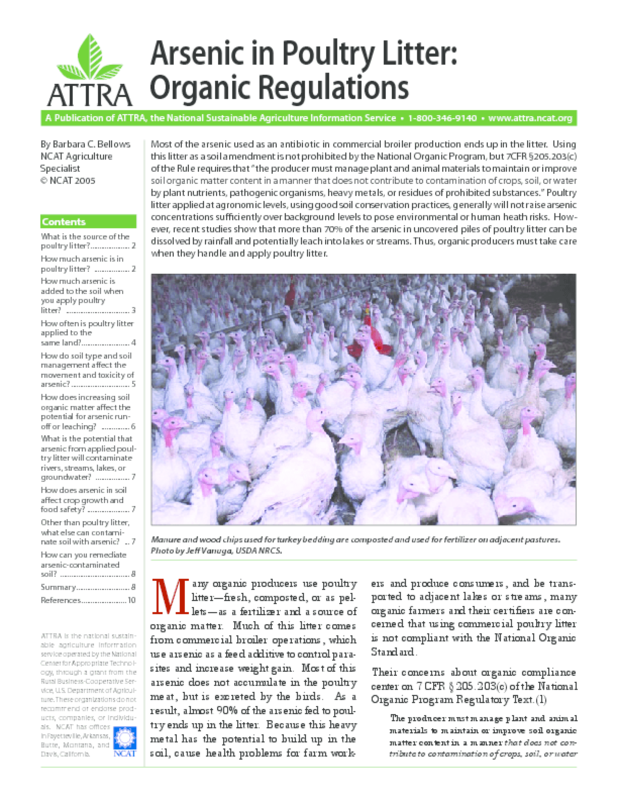 Thus, organic producers must take care when they handle and apply poultry litter.